A surprising discovery that hydrogen gas clouds found in abundance in and above our Milky Way Galaxy have preferred locations has given astronomers a key clue about the origin of such clouds, which play an important part in galaxy evolution. more abundant in region above area where central bar merges with spiral arm. Bright point at bottom center is location of our Solar System. "We've concluded that these clouds are gas that has been blown away from the Galaxy's plane by supernova explosions and the fierce winds from young stars in areas of intense star formation," said H. Alyson Ford of the University of Michigan, whose Ph.D thesis research from Swinburne University formed the basis for this result. The team, consisting of Ford and collaborators Felix J. Lockman, of the National Radio Astronomy Observatory (NRAO), and Naomi Mclure-Griffiths of CSIRO Astronomy and Space Science, presented their findings to the American Astronomical Society's meeting in Miami, Florida. 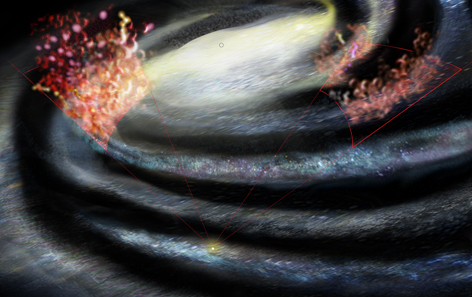 The astronomers studied gas clouds in two distinct regions of the Galaxy. The clouds they studied are between 400 and 15,000 light-years outside the disk-like plane of the Galaxy. The disk contains most of the Galaxy's stars and gas, and is surrounded by a "halo" of gas more distant than the clouds the astronomers studied. "These clouds were first detected with the National Science Foundation's Robert C. Byrd Green Bank Telescope, and are quite puzzling. They are in a transitional area between the disk and the halo, and their origin has been uncertain," Lockman explained. The research team used data from the Galactic All-Sky Survey, made with CSIRO's Parkes radio telescope in Australia. When the astronomers compared the observations of the two regions, they saw that one region contained three times as many hydrogen clouds as the other. In addition, that region's clouds are, on average, twice as far above the Galaxy's plane. The dramatic difference, they believe, is because the region with more clouds lies near the tip of the Galaxy's central "bar," where the bar merges with a major spiral arm. This is an area of intense star formation, containing many young stars whose strong winds can propel gas away from the region. The most massive stars also will explode as supernovae, blasting material outward. In the other region they studied, star formation activity is more sparse. "The properties of these clouds show clearly that they originated as part of the Milky Way's disk, and are a major component of our Galaxy. Understanding these clouds is important in understanding how material moves between the Galaxy's disk and its halo, a critical process in the evolution of galaxies," Lockman said. The clouds consist of neutral hydrogen gas, with an average mass equal to that of about 700 Suns. Their sizes vary greatly, but most are about 200 light-years across. The astronomers studied about 650 such clouds in the two widely-separated regions of the Galaxy. The Parkes Radio Telescope is part of the Australia Telescope, which is funded by the Commonwealth of Australia for operation as a National Facility managed by CSIRO. The National Radio Astronomy Observatory is a facility of the National Science Foundation, operated under cooperative agreement by Associated Universities, Inc.